Taylor Eastridge – 43, Cameron Lasley – 43, Hunter McLaughlin – 48, Tristan Waddle – 48, Jacob Gentry – 48, Keaton Puckett – 48, Chase Childress – 55, Matheo Lynn – 44 and JT Holcomb – 48. 51 Cameron Mullins 13:58, 55 Connor Nicholas 14:03, 63 Silas Taylor 14:22, 71 Jacob Hinton 14:48, 75 Canaan Taylor 15:00, 81 Will Faulkner 15:12, 100 Ricky Locke 15:51 and 102 Grayson Miller 15:52. The LCHS Boys soccer team is now 8-5 on the season after participating in the Barren County Trojan Classic September 18-19. Their next match is away on Tuesday, September 24 when they take on Grayson County at 5 p.m.
Ethan Hawkins 3, Mason Hyatt 1,Dalton Skaggs 1, Chase Watson 1 and Thomas Williams 1. 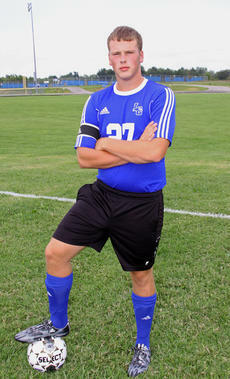 Over the last four years Senior Hawks Soccer player Chase Watson has had one goal in mind and that is to be the first to win a district championship for LCHS. Three months ago, Watson wasn’t sure if that goal would be possible with the departure of Coach Derek Bell. Enter Head Coach Dodd Caudill, and Watson now believes the Hawks are primed to win the first ever championship for the Hawks ten-year program. Watson, a two-year starter, believes they have the right formula to improve on the twelve wins from last year. 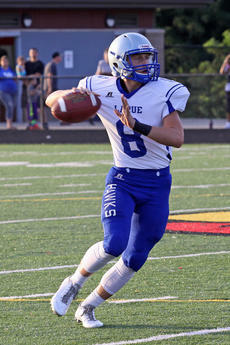 The LaRue County Hawks football team lost to the Danville Admirals last Friday night 41-14. 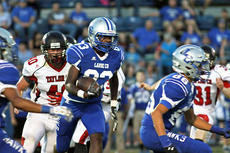 The amount of yards on offense and the inability to get the ball into the end zone would prove to be the deciding factor in the Hawks’ loss as they were shut out by the Admirals defense in the first half with a score of 41-0 at halftime. The Hawks also weren’t able to stop the bleeding on defense in the first half and the Hawks special teams also gave up a 54 yard punt return in the first quarter. This year marks the fifth year in a row that the LaRue County High School cheerleaders will be pursuing a bid for the Universal Cheerleading Association’s National High School Cheerleading Championships. It is the largest and most prestigious cheerleading championship in the United States and showcases cheer teams from almost every state in the nation. The competition will be held at Disney World on February 6-7,2016, and will be featured on ESPN in April. The LaRue County Lady Hawks volleyball team is 3-1. Their next match is against Thomas Nelson at home this Thursday, August 27 at 7 p.m.
Cidney Neagle: 6 kills and 2 aces; Chloe Owen: 3 kills, 3 aces and 5 digs; Presley Brown: 3 kills and 1 block; Breea Kirkpatrick: 4 aces and 4 digs and Keeahna Bowen: 15 assists. 1-1 on the season. Their next match is Thursday, August 27 when they travel to Glasgow. Game time is 6 p.m. Saves: Cameron Pelligrino 61-1 on the season. Their next match is Thursday, August 27 when they travel to Glasgow. Game time is 6 p.m.